The DWQI is currently developing an MCL recommendation for 1,4-Dioxane (CAS #123-91-1). As part of this effort the DWQI is requesting submittal of data and information related to 1,4-Dioxane. The DWQI has 15 members - six members serve ex officio and nine members are appointed, three each by the Governor, the Senate President, and the Speaker of the Assembly. Appointed members are from the academic scientific community, members public with background in environmental health and from regulated public water supply systems. The Chairman is designated by the Governor. For carcinogenic contaminants - establish a standard which would not, within the limits of medical, scientific and technological feasibility, permit cancer in more than one in one million persons ingesting the contaminant over a lifetime. For noncarcinogens - establish a standard, which would not result in any adverse physiological effects following ingestion within the limits of practicability and feasibility. The Testing Subcommittee is responsible for developing appropriate analytical methods to measure levels as close to the health-based levels as possible and for developing appropriate monitoring frequencies. The Treatment Subcommittee is responsible for evaluating best available treatment technologies for removal of the hazardous contaminants from drinking water, as well as overall program review. A Radon Ad-Hoc Subcommittee was formed to evaluate the risks, costs, and benefits associated with regulating radon in drinking water based on occurrence data within the State. 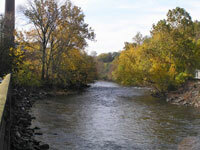 Institute members, including subcommittee chairs may be contacted at watersupply@dep.nj.gov. Please be sure to identify the subcommittee or subcommittee chair that is the intended recipient. If you are requesting an opportunity to present information to a subcommittee please also include a paragraph describing the presentation topic. There are no open comment periods at this time. Information regarding previous comment periods and submitted comments are available upon request to watersupply@dep.nj.gov. The DWQI is requesting new technical information. Click on the link above for details. 1984 amendments to the New Jersey Safe Drinking Water Act (Act) at N.J.S.A. 58:12A- 20, established New Jersey’s Drinking Water Quality Institute (DWQI) as well as the drinking water standard setting process. The DWQI is responsible for developing Maximum Contaminant Levels (MCL) or standards for hazardous contaminants in drinking water and for recommending those standards as well as recommendations for the implementation of the drinking water quality program to the Commissioner of the N.J. Department of Environmental Protection (NJDEP).